Nippon Ichi's American SRPG invasion begins with this devilish title. Demon prince Laharl gathers an army of fighters in hopes of recapturing the Netherworld. Atlus USA sees the world isometrically, and that’s obvious after seeing the mess of strategy games they’ve brought us, including the Tactics Ogre series and even the unfortunate Hoshigami, which alone should be a testament to their dedication. Not to mention Nippon Ichi’s Rhapsody, which was isometric despite not being very strategic and appealing to less than a tenth of the country’s gamers. But with that, a partnership of sorts was sparked with N1, and while the rest of their saccarhine catalog has yet to leave Japan, we do have Disgaea, a cute yet sinister full-on strategy game. 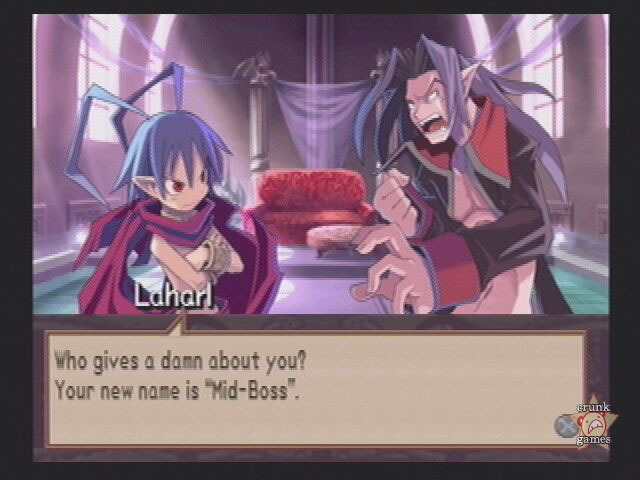 Disgaea is about Laharl, a feisty demon prince from the Netherworld and the son of the late King Krichevskoy. Laharl’s been asleep for a few years, so he’s missed his dad’s death. But after awaking, he brushes that news off and soon learns that all sorts of demons have been trying to succeed the throne. Laharl won’t have any of that, so he sets out to form a legion of loyal subjects to help him fight the good (bad?) fight. As the tale moves on, the player is assaulted with goofy characters and wry humor, not just in the dialogue but everywhere, from item descriptions to the peg-legged Prinnies and their frequent utterances of "dood!" Disgaea goes a long way to keep itself from being serious, and it works out marvelously. 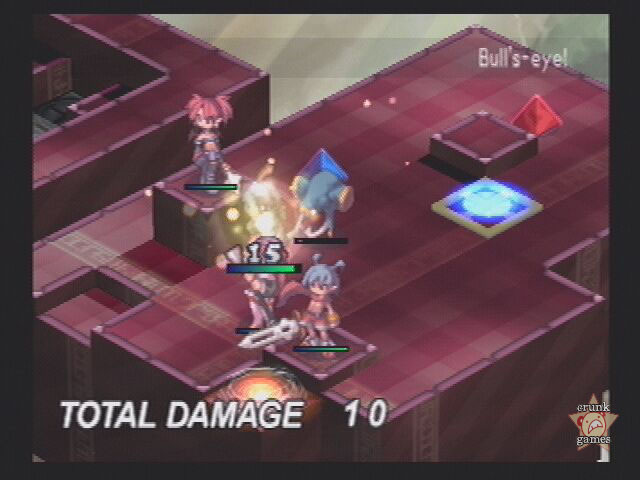 At the outset, battles in Disgaea are just like any other console SRPG, but with an emphasis on speed and efficiency. A generous ten units can be dispatched in every stage (with the ability to hot-swap continuously through the map’s Base Panel), and turns are decided simply by who goes first. With a multitude of unit types at the start and more as you make progress, your army can be customized to the point of no return. An interesting move the game adds to the genre is enabling human characters to "Lift" and "Throw" any adjacent unit, which can be used to cause damage or get one of your own up close and personal with the enemy. One of the attract demos shows someone building a tower of their units and throwing them all about the map, so again, depending on how you use your brain you can create some deadly formations. 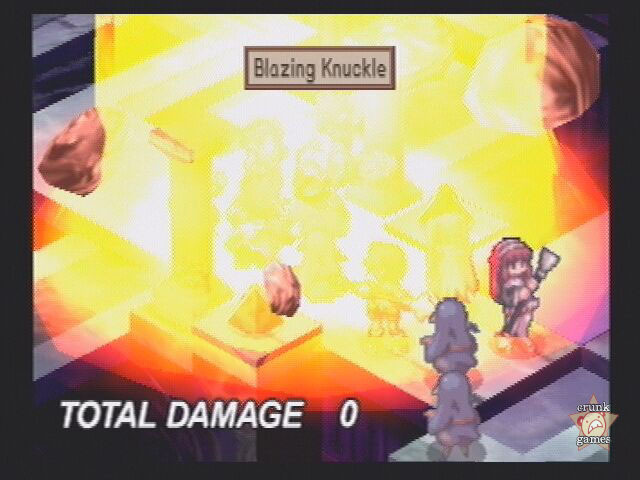 Disgaea is more than straightforward battles, though, oh yes. There are three important elements of the game that blow its doors wide open and prove the game’s staying power. The first we’ll touch on is the Geo Panel system. In each stage there may be patches of pulsing colored panels, known of course as Geo Panels. The colors themselves don’t have much bearing, but carry status effects if a pyramidal Geo Symbol is placed on them, such as a 50% increase in defense. If the effects don’t jive with you, simply destroy the Symbol and the effects will be wiped away. Depending on the situation, you can overlap the colors by destroying Symbols in sequence and create devastating "color chains" that can damage enemies and earn you some sweet bonuses. Most of the time the Geo Panels can be an annoyance, causing strides to be made to erase them as quickly as possible, but more patient players will devise color chains that will have them on easy street. More power to them; after all, Disgaea is a game of freedom. 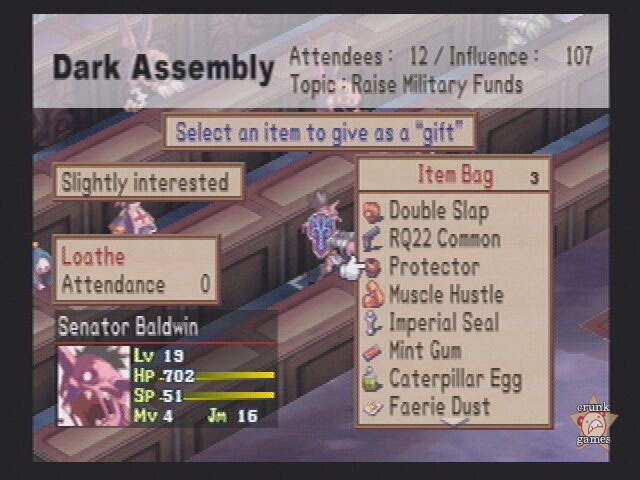 The next big arm of the game is the Dark Assembly, a congregation of demonic senators who control all sorts of issues in the world of Disgaea. Most importantly, you can create new units here to join your army, which will require an investment of Mana from whomever is doing the creating. Mana is earned by killing enemies, so keeping it spread evenly across the party can be helpful. A created unit becomes the pupil to the creator, and the creator earns perks as the pupil advances, including being able to use the other’s spells. The second part of the Assembly is being able to submit proposals to the senators. Proposals run the gamut from simple requests (cheaper items) to detailed demands, and you have to make sure it passes with the Assembly. You can easily influence senators by giving them items as gifts, but sometimes you’ll be outright rejected, and it’s here where the game gets interesting. You can challenge the senators to a battle which can determine the final outcome of your proposal depending on if you win or not. More proposals become available as a character’s "rank" increases, which can only be raised by taking the Assembly’s Promotion Exams, one-unit-only battles that you’ll have to survive in order to expand the list. Lastly we have the Item World, wherein every weapon and consumable has its own family of monsters living inside it. Going inside an item is as easy as doing so in the main castle. From there, you fight through multiple randomized "floors" of the item, clearing out enemies along the way. The point is to raise the item’s own levels, thus strengthening its effectiveness, but basically it’s another way to test your skill as the items typically house stronger enemies and/or complicated Geo Panel setups. However, exploring the Item World is not completely necessary to finish the game, and you’re told that early on, but it’s a great help if you’re good enough. With this and the other systems in the game (and a load of other little things we couldn’t cover here), it makes clear the fact that the game is only as deep as you make it. This may turn off some players who are looking for practicality, but such extra aspects are valuable to people wanting more replay value. And those people will be greatly rewarded. Besides, whoever heard of a short SRPG? 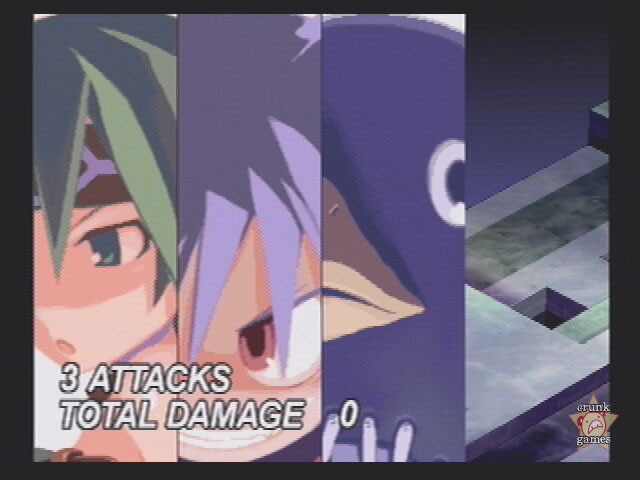 If you have trouble grasping the systems, Disgaea does offer in-game help. But aside from the opening tutorial battle, it doesn’t do all that great a job at teaching you what to do, opting to just tell it to you rather than go through the menus and show you automatically. Granted, it’s much more detailed than the manual, but can still be a hassle for the newbie. So Disgaea is filled up to the rim, but unfortunately, the game does look low-res, which is admittedly common in N1’s other PS2 games. But to appease that, and because there isn’t much detail, everything moves very smoothly and without slowdown. The music is mostly a nice blend of standard RPG suspense and plinky, cartoony "villain" tunes, although the music in the home castle can get really grating really fast since you’ll be going back and forth a lot. The rest of it is pretty diverse, fitting the absurdity of the game’s personality and generally just being really good. Confusion arises when playing with English voices, as songs with Japanese vocals have been stripped to just the tunes themselves, as if we’re afraid of the language or something. The inclusion of music by US punk band Tsunami Bomb isn’t entirely germane to the game’s atmosphere, but the one song is only played a couple times anyway, and we appreciate Atlus adding something extra for the western release.